Ishtar Is Finally on Blu-ray. And It’s Good! Warren Beatty and Dustin Hoffman being funny. A week ago, I got an email with this subject line: “Ishtar [Blu-ray] is now available to order from Amazon.” Really?! I thought. I set up that Amazon alert ages ago! The Blu-ray, I quickly learned, was coming out the very next week—i.e., today. Where was the fanfare? I generally keep up with new DVD releases; it’s part of my job. But this one, which I had been keeping a digital eye on for years, somehow escaped my notice. I scrambled to acquire a press copy, but to no avail. In truth, I would have had trouble watching one if it was sent my way, because I don’t actually have a device that plays Blu-rays. And, in any case, a few months ago, I finally got to see the movie, which has long been largely unavailable, at a screening in Brooklyn. It was delightful. A quick bit of background: Ishtar, as you may know, is quite possibly the most notorious flop of all time. 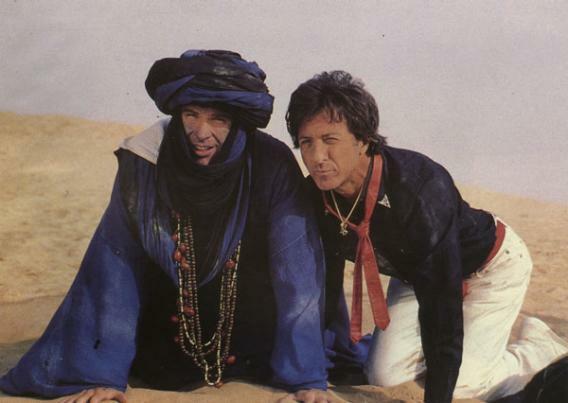 The 1987 film stars Warren Beatty and Dustin Hoffman as struggling songwriters who get a booking in Morocco “and get caught up in the deadly political intrigues of a neighboring North African country, the fictitious Ishtar, involving the C.I.A., a left-wing revolutionary organization, and international jihadis.” The movie cost more than $50 million to make and made a little more than $14 million. It was savaged by critics. It may have prompted Coca-Cola, then the parent company of Columbia Pictures, to get out of the movie business. It may have ended the directorial career of comic legend Elaine May. And it’s good! Really. Yes, it’s a bit of a mess, at times, and it is definitely strange. But it is amusingly, anarchically so: Beatty and Hoffman have a very funny chemistry, and they are surprisingly persuasive as bumbling, utterly unsuccessful idiots. (The version that I saw—and that is on the new Blu-ray—is a director’s cut, which is apparently two minutes shorter than the version released in theaters; I don’t know how else it differs.) Even more surprisingly, the casting against type—Hoffman plays the ladies’ man, Beatty the insecure dope—totally works. You can get a good feel for their back-and-forth in the movie’s opening scene, in which they write a song together. Happily, it’s available on YouTube. If that does not make you laugh, then you will probably not like the movie. But if, like me, you crack up every time Beatty sings, “When you get out of that tunnel, you’ve got bitter herbs,” you may very well enjoy the silliness to come—which sustains the off-kilter comedy of this opening, just with more camels. And it’s not merely silliness: “May also delivers sharp political satire on the international chicanery of the Reagan years,” as Ishtar champion Richard Brody put it a few years back. As for special features, it comes with nothing. I don’t mean nothing as in extras that aren’t worth taking a look at or merely a theatrical trailer, I mean literally nothing. Here was a great opportunity to hear from the cast and crew about what they thought of the film then and now, as well as what they thought about working on it. It was also a perfect opportunity to get an answer to my question from earlier about what it was that drew Hoffman and Beatty to these roles. Perhaps they were just too embarrassed to revisit it, though I certainly wish they would have. So do I. Still, the new disc comes with the movie, and that’s enough.